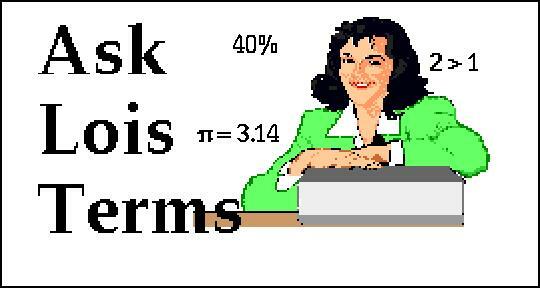 "Helping Students Everywhere to Understand the Mysteries of Mathematics"
PERCENTS: Basic Concepts I: In percents, whole things are always divided into a hundred pieces. Issue #1:  Comparing Fractions;  Read about Lois's Pets;  A Cheer for 7 x 8! Issue #6:  Canceling fractions; The Invisible Decimal. Issue #8:  Finding the Area of a Triangle. Issue #20:  "Finding the Area of a Polygon"
Issue #21:  "Rules for Signed Numbers"
Issue #22:  Solve a Triangle Puzzle. improper fractions to mixed numbers. Page created by William M. Lindsay, Ph.D.